For even the most botanically challenged, terrariums are easy to make and generally low-maintenance; they also make great gifts and fantastic favors! Join us as Stacey and Kyle of Glass Gardens by Stacey teach you everything you need to know to create and care for your own little tabletop oasis. $20 course fee required when registering (+ applicable fees if using credit/debit card). If you wish to pay using cash or check, you may do so in person at the Information Desk. 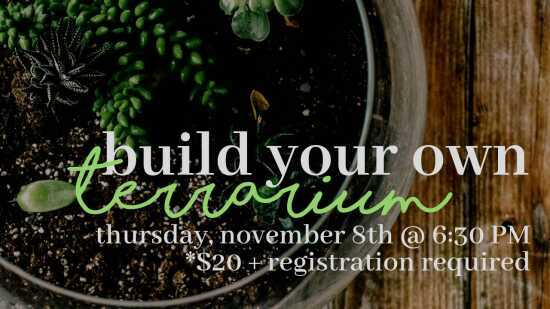 Fees include instruction, glass container, soil, soil toppers, and two plants.